Requires SecuROM 7 DRM disc check or persistent internet connection (later versions). This DRM was briefly patched out of the game, with 1.71 (no expansions) being the last version to require neither internet, nor a disk to play. Fully patched. See New Steam Version. The New Steam Version (included alongside the original THQ release) has all the multiplayer components modified to use Steamworks, as the original multiplayer servers are no longer available. 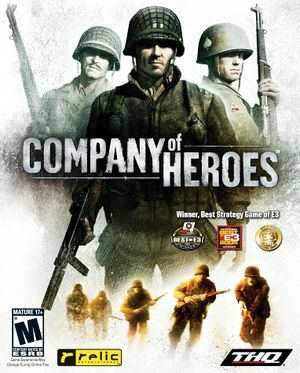 Company of Heroes: Opposing Fronts and Company of Heroes: Tales of Valor count as DLC and do not require any extra downloads. The OS X release of the game, it includes the Opposing Fronts and Tales of Valor expansions. Note that multiplayer is not included. Introduced via patches. Up to 8x MSAA. 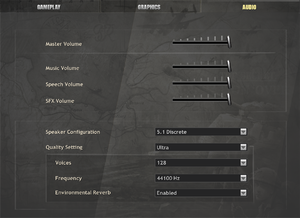 See Game chooses incorrect refresh rate. 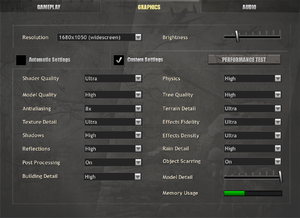 The game may not choose the highest refresh rate supported by the screen. Launch the game with the -refresh 120 parameter (where 120 is the screen refresh rate). The latest Steam version of this game won't start on some systems, crashing back to the desktop immediately. Extract into the installation folder, replacing the existing file. If the game is in German after this fix open Locale.ini in the installation folder. Change lang= to the language you want (for English use lang=English). The game will crash when loading into any map. This is possibly caused by SLI/Crossfire cards. Set the graphics settings to high. 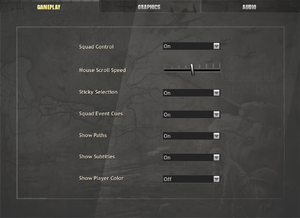 If it still crashes, use borderless windowed with ultra settings. When launching the game on a dual screen setup, the secondary monitor will often be blacked out. ↑ 1.0 1.1 File/folder structure within this directory reflects the path(s) listed for Windows and/or Steam game data (use Wine regedit to access Windows registry paths). Games with Steam Cloud support may store data in ~/.steam/steam/userdata/<user-id>/4560/ in addition to or instead of this directory. The app ID (4560) may differ in some cases. Treat backslashes as forward slashes. See the glossary page for details. This page was last edited on 30 September 2018, at 09:18.